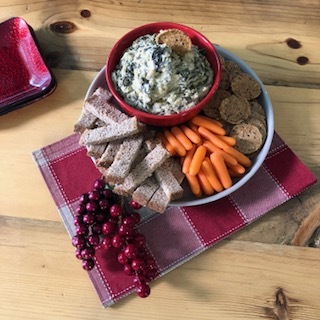 Go guilt-free over the holidays with a dip recipe that will surely wow any crowd. In Episode 6 of our Make it with Hamilton Beach series, host Miranda Malisani shows us how to whip up a delicious bowl of spinach and artichoke dip using the Hamilton Beach White and Stainless 10 Quart Slow Cooker and MultiBlend Blender. The kicker? This dip is dairy-free! Spinach dip is traditionally full of cream, butter and cheese. This version is free of dairy and uses the creaminess of cashews to add richness to this dip. In blender, pulse cashews until it becomes a fine powder. Add milk, avocado, garlic, lemon juice, mustard, nutritional yeast and salt. Blend until smooth. Pour the liquid into the slow cooker and add the spinach and artichoke hearts. Stir until well combined. Cover and cook on high for 1.5 to 2 hours or low for 3 to 4 hours. Serve warm directly from slow cooker or at room temperature in your favourite bowl.